Well here we are, the dreaded week. 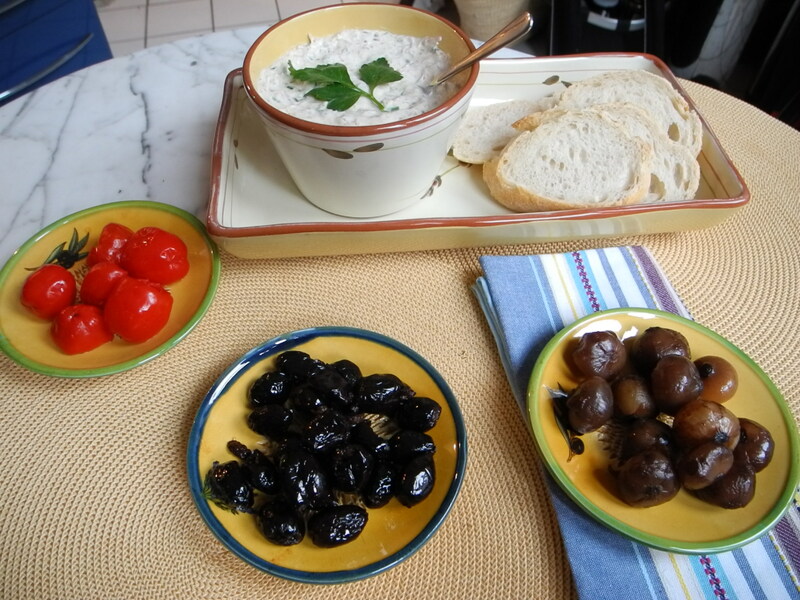 This week’s French Fridays with Dorie recipe is… dum dum dum… Sardine Rillettes. Some of you may have noticed by now that I am actually the one who was crazy enough to nominate this recipe and, given the panic that it seems to have invoked, I feel the need to submit a plea in my defense. You see, it was not that long ago that Tuesdays with Dorie wrapped up. I never participated in TwD, but I was certainly aware of it and read a few of the articles which came out as it was coming to an end. The end of TwD had me thinking about where our little group will be in 3 years as we are wrapping up French Fridays with Dorie, and I was wondering which recipes we would be making together in those final months. And suddenly it occurred to me, the way things are going, with us voting each month for our favorite recipes, the end might be a little scary. Because really, is chopped liver ever going to win a vote? I don’t think so. Aspic? Not a chance! But this project is about cooking the entire book and that means that all those scary recipes have to come up some time. Would we rather sprinkle them in with the others or do we want to save them all for the end? All right, enough procrastinating, bring on the sardine rillettes (recipe published here). Maybe now would be a good time to point out that rillettes, a dish usually made with pork, is basically just a meat spread. Kind of like a pate, but the consistency is not as smooth and you should be able to see the shredded chunks of pork. Having heard that sardines vary greatly in quality I decided that I would give this recipe a fighting chance and buy the most expensive sardines I could find, which frankly, were not all that expensive. In the end I ended up buying the ones in the prettiest tin… check it out, cool huh? But once the tin was open, no longer so pretty. At that point the only one who was excited about this dish was the cat who, having heard the sound of a can opening, starting twirling himself around my feet, hoping to get a taste of whatever was being made. Let’s just say it… the fact that the cat was interested in this recipe did not bode well for it. But I bravely (if also a little squeamishly) drained and deboned the little fishies and set them aside while I mixed up the rest of the ingredients: fresh cheese, shallots, scallions, lime juice, and some chopped herbs. Without the sardines, it was actually looking quite tasty. But I couldn’t ignore the sardines forever, so I finally added them in and mixed everything around. It is at this point that Dorie suggests that we taste test the mixture to see if it needs more seasoning or citrus. For the briefest of moments I actually thought about letting the cat do the taste testing for me, but then I remembered that I’m a grown up. Darn. And after all that build up… it tasted like tuna. Really, like canned tuna. Not like some scary fishy pungent nightmare, it tasted like tuna. Good grief, I just about laughed at myself for getting so worked up over nothing. We served our sardine rillettes with toasted baguette and assorted antipasti. All in all a quick and simple weeknight meal. Dorie has once again shown me that I need to be a little bolder in the kitchen and not be so easily frightened by a scary sounding title. And yet, oh Dorie, I am still dreading the aspic. This entry was posted in french fridays with dorie and tagged Around my French Table, fish, starters. Bookmark the permalink. Great photos, and I like the tin your Sardines came in. Just still can’t do them, tried them, don’t like them! You are absolutely correct about needing to do the sccary things too! For a second there, I thought this spread tasted like tuna fish salad. Great post! Nope – I totally agree with the logic to get some of these out of the way (I am absolutely with you on this one) – I just wish I could have found tuna like sardines. Apparently, my most expensive tin approach backfired on me. Maybe we should go for aspic next month 🙂 At a minimum these make for fun reading. Too true, the scary ones are quite entertaining to read about. Glad to read that in the end you did like the sardine rillettes. Nice post – I enjoyed reading it. Frankfurt is not far from the Bonn/Cologne area where I live…Schönes Wochenende! So happy to find another blogger liking this! Love your sardine can…I would have totally gravitated to that one. Have a great weekend! Isn’t it cool! I was almost sad to open it up and throw it away. I have found that most people who don’t like sardines just haven’t tried them. Oh, and they love tuna too. I adore them and I think this dish is best served as a picnic just as you have done. great work! I also think that there tends to be an association with anchovies, with the two being often mistaken for one another. Oh Rose, you totally won me over with the argument of getting over the dubious recipes and save some great ones for the last stretch. Way to think about the long term! I’m glad you nominated this one. I agree, I definitely don’t want to leave all of the scary recipes to the end! I love the can that your sardines came in, it’s very pretty. I was hoping this would taste like tuna to me but it tasted much stronger, but maybe I just bought the wrong sardines. I’m definitely glad I tried it, though, and glad that you enjoyed it! And thanks for answering my question about white asparagus. My husband was actually talking about trying to grow some, maybe it would be an interesting experiment. I look forward to the chicken liver recipe, but aspic will not work for me either. Just the thought of that makes me gag. I love your presentation served with the anti pasta, it looks lovely. My husband loves sardines and we always have a few can of these in the house. smelts and I have to clean them. Gross. That sardine can is pretty gorgeous. Glad you liked this more than you thought you would & I totally agree with your scary recipe logic. It’s good to conquer our food fears gradually, not all at once! Great post, and I have to agree with your sentiments about not saving all the dreaded recipes for last. I wish I could say that my rillettes reminded me of tuna, since I do like me a good tuna salad. 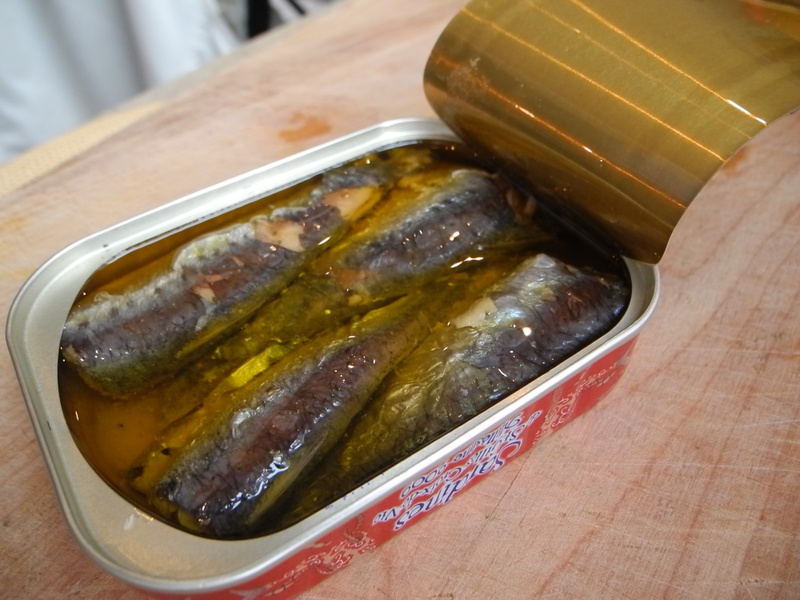 Maybe my sardines were too fishy since they didn’t come in such a pretty tin! My husband makes fun of me for picking wine bottles based on the labels. I would totally pick that can of sardines if I’d seen it in my store. I think your logic on this is tres sound. We don’t want to end this adventure with a month or more of dread. Let’s continue sprinkling those bad ones in once in a while. Possibly the scariest one for me is next week. Well I’m happy to hear that at least one of us is looking forward to the aspic. That one will really test my dedication to the cause. What a great post, Rose. I am so with you on sprinkling some of these not-so-tasty-sounding recipes here and there. I wish I liked this one more, but I prefer tuna – this was just a little too strong for me. I would have totally bought that can of sardines because of the pretty tin as well! 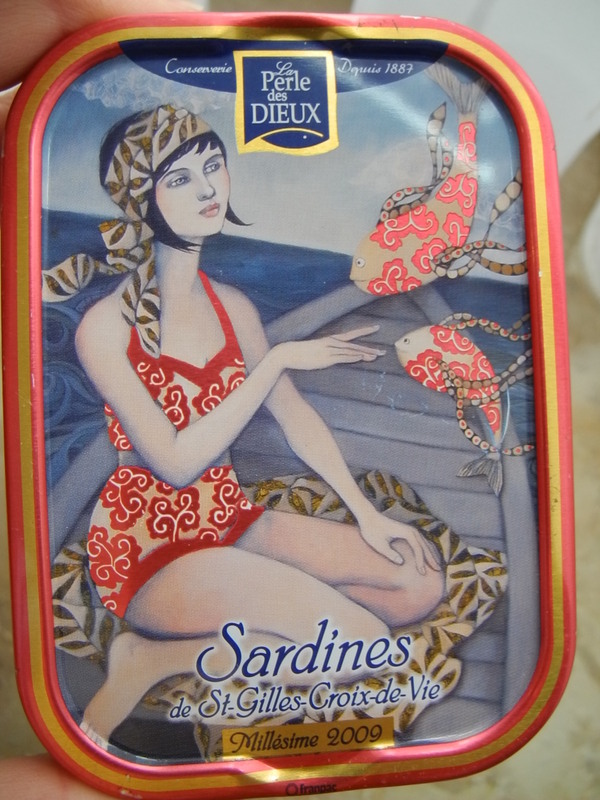 That is the prettiest tin of sardines I have ever seen! I went the other way and bought the cheapest tin, which was no frills black and white. It still worked just fine – a good investment of 69 cents. The tin is really pretty! I would have bought those too. I agree that we need to start adding in some of the more …interesting/scary recipes in, I definitely don’t want the last recipe to be Aspic! I DID make this, I swear! I just haven’t managed to post about it yet. I’m not gonna lie. Matt and I both hated it. One bite each, and we were done. Glad it’s over with, though! Thanks for stepping up and nominating this one! Once I actually read the recipe I realized it didn’t sound so bad. Hopefully some of the other scary ones will pleasantly surprise us too. I realized that after the first month and noticing some of the “scary” recipes that were in there…! I was wondering when they would come up… all i know is I’m sitting the aspic out. If I make it, I dont know anyone around for miles or on any continent that would try it… lol 🙂 oh well, this wasnt a “scary” recipe for me and glad to see that you liked it too! Rose, I loved your wonderful post…I’m really sorry now I didn’t jump in and make this! But somehow I just couldn’t bring myself to make anything with sardines in it! I definitely have an aversion to sardines and anchovies! I have read many of the FF posts and it sounds as if most people enjoyed this recipe! Maybe I’ll do a catch up….maybe not! Rose, you are a brave, brave soul! While I totally support your logic – and even agree with you – I was just not up for this one! My Dad used to eat tinned Sardines, Smoked Oysters, and anything else he could find that would make us squirm! I’m glad you enjoyed this, but I am looking forward to baking with coconut this week! I am glad you pushed us to try the unattractive! I really like the antipasto presentation, wish I had thought of that.